For the 18th year, Oracle and HMS have renewed their technical partnership with Oracle naming HMS once again as an Oracle Gold Partner for the 2015-2016 season. HMS is delighted to count Oracle among our key technical alliances. The relationship is one of the longest standing technical partnerships of its kind in the industry. The TimeControl timesheet system now supports many different products that have become part of the Oracle family including the architectural support for the MySQL database and as links between TimeControl, Oracle EBS, PeopleSoft and JD Edwards. We work regularly with Oracle to support our mutual clients. The Oracle Partner program in which HMS has been named as a Gold Partner again this year is designed to allow software publishers such as HMS to work directly with Oracle to more effectively bring products and services to each other’s clients. Thanks to our status in the Oracle Partner program our integration with Oracle-Primavera P6, for example, can be tested on pre-release versions. Some of TimeControl’s value-added benefits when linking with Oracle Primavera include: multiple rates per employee, automated business rule validations, automated workflow, missing timesheet notification, simultaneous support for multiple versions of Oracle Primavera, both a browser and mobile/tablet interface and matrix timesheet approvals with HMS’s unique Matrix Approval Process for Labor Actuals™. We value our relationship with the Oracle team and are very proud to be an Oracle Gold Partner this year and for many years to come. 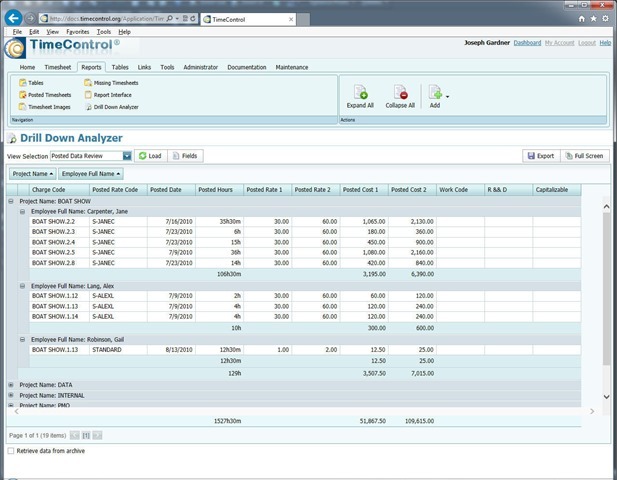 With the release of TimeControl 6.5, organizations are now able to create a remarkably powerful project management environment by combinging the best of HMS’s TimeControl, Hard Dollar’s HD and Oracle-Primavera’s P6 all at the same time and we have created a TimeControl Solution Portal to give you access to resources on how this could help you with organizational efficiency. Haven’t you ever wished you could take the best of the most popular project management tools and blend them together? Now, thanks to TimeControl version 6.5, you can. 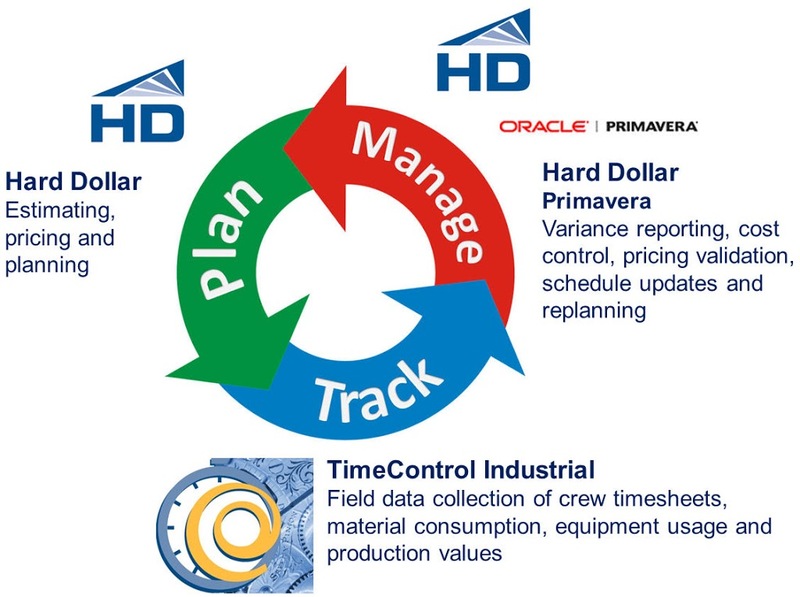 You can now integrate TimeControl or TimeControl Industrial with Hard Dollar’s HD and Oracle-Primavera’s P6 simultaneously to create one remarkably flexible and powerful environment. Hard Dollar is known for its strength in project cost estimating and cost control. It has been used for years in construction, engineering, utilities, mining and other industrial industries to create a rich definition of cost requirements for labor, material and equipment requirements for projects. 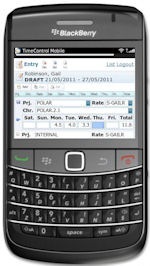 Primavera is world-renowned for its project scheduling, project tracking and resource capacity planning functionality. TimeControl Industrial brings field data collection to a new level. 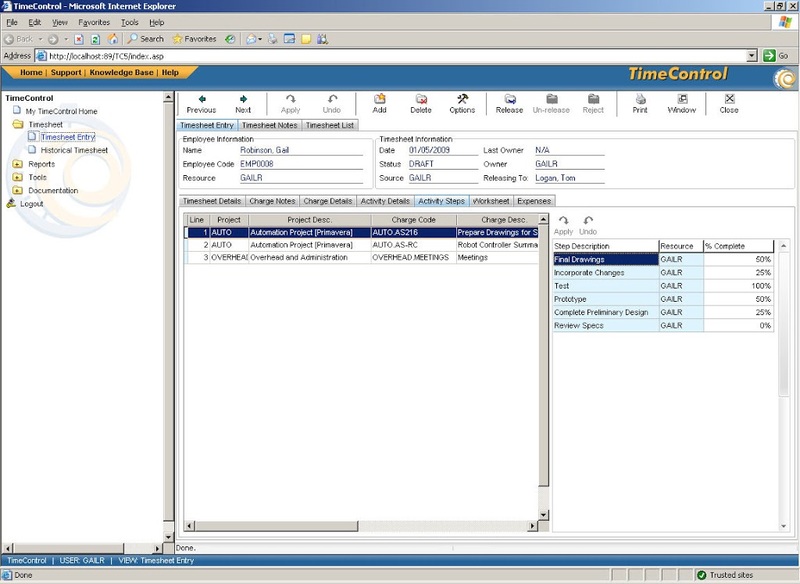 TimeControl has been available since 1994 and is one of the world’s best known timesheet systems. TimeControl and TimeControl Industrial have had the ability to integrate with Primavera since 1997. When Primavera users need to extend timesheet capabilities to meet financial requirements for not only job costing but also invoicing, payroll, HR and numerous government compliance rules, TimeControl is often the choice. HMS and Hard Dollar created a technical alliance in 2012 to create the same kind of integration between TimeControl Industrial and Hard Dollar’s HD cost control system and while doing so realized that something remarkable was possible. There was already an integration between HD and Primavera’s P6 and the addition of TimeControl Industrial which already had the P6 integration itself meant that all the products could be combined together. The TimeControl/HD integration was designed with that requirement in mind and it has surpassed our best hopes for improved efficiency. The bi-directional link between TimeControl and HD brings in job definitions and sends back the actuals on a day-to-day basis. The bi-directional link between TimeControl and P6 brings in activity and step definitions along with resource assignments and sends back not only the resource and financial actuals but also estimate to complete and Activity Step progress. TimeControl’s unique Matrix Approval Process for Labor Actuals™ means that data arrives already approved from both the organizational and project perspectives and is ready to use by Project Management, Job Costing, HR, Payroll and Finance. It’s the best of not just both but all three worlds. A blend of the best in world class performance from the leaders in project management systems. For information on TimeControl Industrial, go to industrial.timecontrol.com or contact HMS Software at info@hms.ca, or call us toll free at (877) 699-8463 (International +1 (514) 695-8122). We have many clients who use TimeControl with their Oracle-Primavera system. Perhaps it’s no surprise. TimeControl has integrated with Primavera since 1997 with P3 and we’ve maintained that link all the way up to the most recent P6r8 release even once Primavera was purchased by Oracle. Primavera clients who need a single timesheet to update not only the task progress in Primavera but also Payroll, Billing, Finance, Job Costing or HR have looked to TimeControl to provide multi-purpose timesheet functionality that will allow a single point of timesheet entry and multiple back-end uses. Our relationship with Primavera goes back to 1997 and our relationship with Oracle separately also goes back to 1997 when TimeControl was first able to store its data in either SQL Server or Oracle (We now also support MySQL which is coincidentally also owned by Oracle). So the relationship has many facets and runs deep. We’ve done a little work to remake our TimeControl and Primavera Solution Portal with a range of new materials that we hope you’ll find useful. Aside from a remake of the portal itself, we’ve got new factsheets, slide presentations, white papers and an all-new on-demand webcast that shoes TimeControl 6 and Primavera’s P6 interacting back and forth. The integration options between TimeControl and Primavera are extensive. Not only can you bring into TimeControl Primavera tasks, resources, steps and assignments, you also have abilities on how to match employees to generic skills and Primavera codes to TimeControl user defined fields. Updating your Primavera project data with TimeControl timesheets is incredibly flexible. You can update hours and costs, Primavera Step progress, ETC, Financial periods and more. Access to the portal and its resources is free. Find out more at www.timecontrol.com/solutions/primavera. This solution portal contains numerous resources other than those we’ve listed here on how to select a timesheet for your needs and how TimeControl might apply to those requirements. See more at buyersguide.timecontrol.com. For those using TimeControl 5 or TimeControl 6, you’ll be happy to know that we’ve completed our testing under the just-released version P6r8 and that TimeControl and release 8 are working together just fine. No new TimeControl upgrade is required in order to do your Primavera upgrade as the current releases of TimeControl 5 and TimeControl 6 flew through our tests with flying colors. TimeControl 5.1.2 became available yesterday and along with several improvements came long-awaited support for updating Primavera Steps within the TimeControl Timesheet. As you can see by clicking on the screen at right, there is a new tab called Activity Steps which displays the sub-task level steps and the percent complete for each one. The resource which is designated in Primavera as the ‘primary’ resource will be able to edit the Step progress. Other resources will be able to see them only. New Steps cannot be added within TimeControl. They must be done within Primavera itself. You can see a quick video of Primavera Steps working within TimeControl 5.1.2 on the TimeControl 5.1.2 Steps Screencast.